This was the ambitious aim of National Housing Federation, the national body for housing associations. They work for their members as a voice for the sector, influencing government policy around housing. 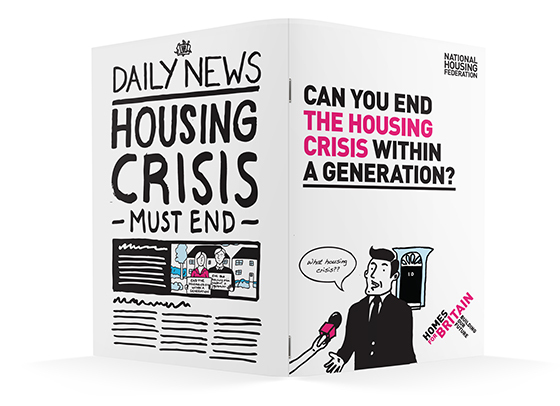 The NHF needed help mobilising their members, residents and the wider public to talk about the housing crisis loudly enough for politicians to actually listen. The goal was to place the housing crisis at the forefront of debate in the run up to the general election and, with a unified direct call to action, end the housing crisis in a generation. While members were aware of the problems in housing, little was being done to lobby government or raise the issue up the political agenda. And the NHF was not perceived by members to be politically daring. Both things had to change. 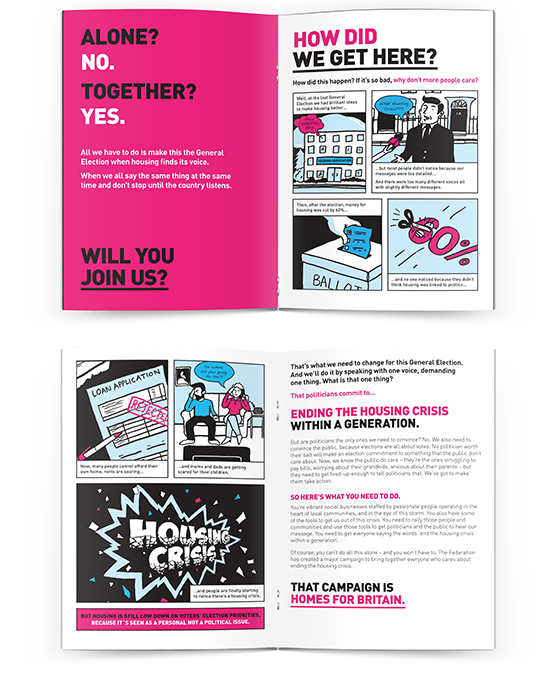 They came to us with the campaign concept – the road to the general election – which we developed into a political cartoon styled illustrated pack that took members on a journey. The pack told the story of how housing got to this point and what needed to happen in the run up to the election to create much needed change. 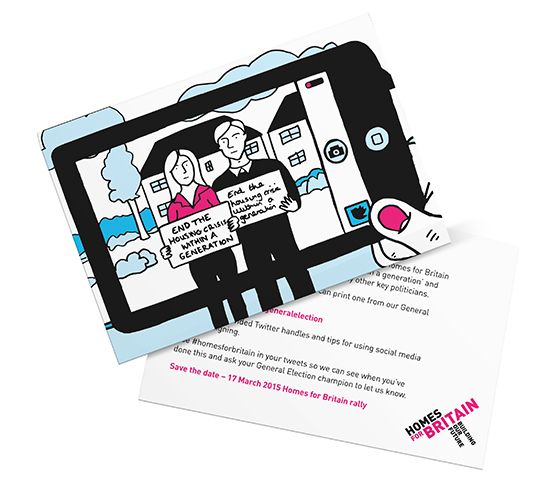 It also included campaign ideas captured in postcards that could be rolled out by members over coming months. Traditionally the NHF had taken a more conservative approach to their campaign materials. Our cartoon styling nodded to more radical political cartoons found in the press, adding an unexpected satirical slant to the messaging while remaining true to the brand and core principles of the NHF. The visual approach wasn’t unrecognisable but it was different enough to make people sit up and notice. The whole look and feel of the pack reinforced the message that members needed to start thinking and acting differently to make change happen. NHF chose their annual conference to launch the campaign, surprising members with the pack hidden under chairs which was revealed during the keynote speech for maximum impact. 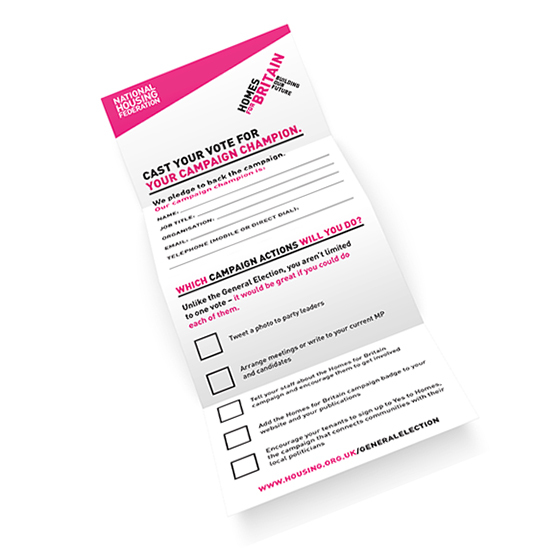 An electronic ‘badge’ formed part of the pack, which members could add to their websites, giving the campaign focus for residents and the wider public. The original brief made it clear that this pack needed to motivate members to go away and do something. And following the conference they did – many requested the artwork for the cartoons to use on their own website to help share the message. So not the end of the crisis. But perhaps the start of housing change.